Harry Styles looks set to reach number one in the UK albums chart this week, knocking Kasabian off top spot in the process. The ex-One Direction star released his self-titled debut solo album last Friday (May 12). According to the Official Charts Company, Styles is number one in the midweek update, 24,000 equivalent sales ahead of Ed Sheeran at number two. Last week’s number one, Kasabian’s ‘For Crying Out Loud’ is down to number seven. The album had ended Ed Sheeran’s two-month reign at number one last week. Other new entries include Paramore‘s ‘After Laughter’ at number three, Paul Weller‘s ‘A Kind Revolution’ at number four and ‘Common Sense’ by J Hus at number six. This week has seen Harry Styles open up about his sexuality in a new interview, saying that he’s “never felt the need” to label himself. Styles also recently responded to suggestions that his new song ‘Two Ghosts’ is about Taylor Swift. Meanwhile, Styles is set to tour the UK later this year. See his live dates in full below. For tickets and information, visit here. 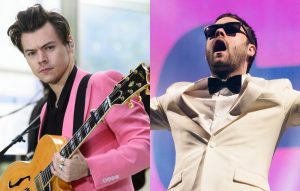 The post Harry Styles to knock Kasabian off top of UK albums chart appeared first on NME.